ah, the striped shirt. I know I own too many, but they’re such a hardworking part of my wardrobe that I don’t mind. I have them in all shapes and sizes – boatneck, v-neck, 3/4 sleeve, short sleeve, etc. – and I’m not even close to getting tired of them. it’s a love affair that has been long and true. the only stripe I’ve met and haven’t liked is the big, bold, rugby one. as a woman with a large chest, I stay far away from those, but every other stripe is fair game. 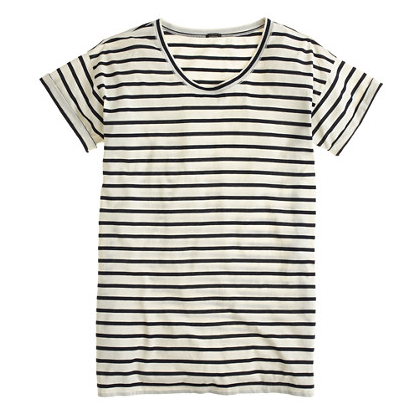 thin to medium horizontal stripes are great; ones on the diagonal are super flattering. pick a neckline that flatters you and a stripe in a color you love and start from there. I have a soft spot for the classic boatneck with navy or grey stripes myself. the shirt above is the newest addition to my stripe collection. I couldn’t resist the longer length, the soft fabric, or the adorably cute side slits. I was worried they’d go a little too high, but after trying it on, they hit just right. I’m going to live in this all summer. more options: this one comes in great colors (I want them all), these are classics, this I bought in both colors and love, and this can be monogrammed. I hope you had a lovely memorial day. back to basics is a series on short&lovely highlighting the workhorses of my wardrobe, the pieces that work day in & day out, without fail. without these babies, then I really wouldn’t know what to wear.